December will soon be here and numerous lists of this year’s protagonists will be published in Cuba. A difficult task in a country that over the last 12 months was visited by a pope, a secretary of state and even by Mick Jagger. However, the person who takes all the palms is not a politician, a religious leader or a rocker. It is a mobile application with a short name and a profound impact on our reality: IMO. With over 150 million accounts worldwide, this video-call tool burst into our daily lives mid-year to shorten distances and reunite families. With its simple interface and capacity to adapt itself to the low speeds of our internet connection, IMO has achieved what insularity and politics has limited for so long: contact with the world. Headquartered in Palo Alto, the startup responsible for this tool for text chats, voice and video, was founded by one of the first ten Google employees, who says that he likes working “on challenging projects.” A maxim that has been extensively tested in Cuba, where despite the technological obstacles the app has spread virally through smartphones and tablets. 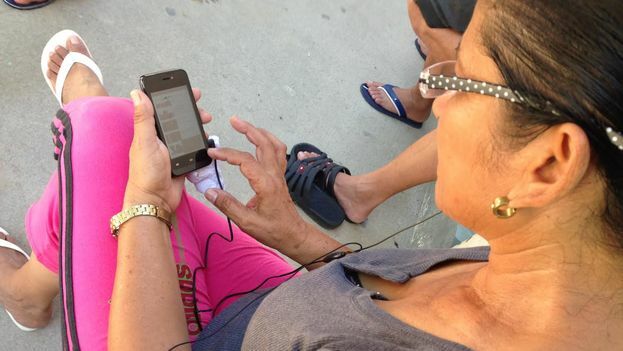 Anyone who says that technology distances us and locks us in solitude, can wander through the wifi zone on Havana’s La Rampa and see the tears and smiles this utility gives rise to when Cubans connect between here and there. The emotions are very much as if they were face to face. There is no coldness on the screen, nothing dehumanizing on the keyboard, when they are the only chance of encountering the people we love. The corner of Infanta and 23 rd, any Saturday. A lady enjoys the son she hasn’t seen for two decades, checks out his latest hair dye, while the emigrant’s sister has brought the dog who also participates in the moment. At their side, a young man no more than 20 insistently repeats, while holding the phone in front of his face, “Don’t delay, get me out of here.” Through IMO we have tackled, in recent months, our hopes and our despair. Even prostitution with foreigners has become more technological through the new utility. Now “the merchandise” is evaluated before the customer arrives in the country. The other day a young girl swept a tablet with a camera over her whole body while, on the other side, someone with a German accent asked if it was true that she was over 18. However, IMO deserves the title of Person of the Year above all because of the key role it has played in the migratory crisis facing close to 4,000 Cubans on the border between Costa Rica and Nicaragua. While the official media remained silent about these rafters-on-foot, this tool has kept their families on the island informed about the fates of their loved ones trapped in Central America.